I hope this message finds you well. If you've been on regular distribution of past messages from this ministry, you may have noticed that I haven't shared/written, (especially any Devotional Starters) in quite some time. I've wanted to write but it seems that it has had to take the back seat for a while because of life, work, and various other ministry activity which at times has me feeling like I've spread myself too thin. Through much prayer, I'm working with the Lord's help to begin changing things so I can get back the fundamental things that He wants me to focus on when He set me on this journey which we know as "RLK Ministries" almost 10 years ago now. Like any believer we want our lives to be filled with God's best for our lives and that doesn't always include what we may think is best for our lives. :-) He is God, we are not, and His ways are better than ours. Have you ever stopped to ponder how much has changed in your life since you came to Christ? Although it's not always apparent to us or sometimes by the example of how we live, however, you and I have become brand new in Christ! 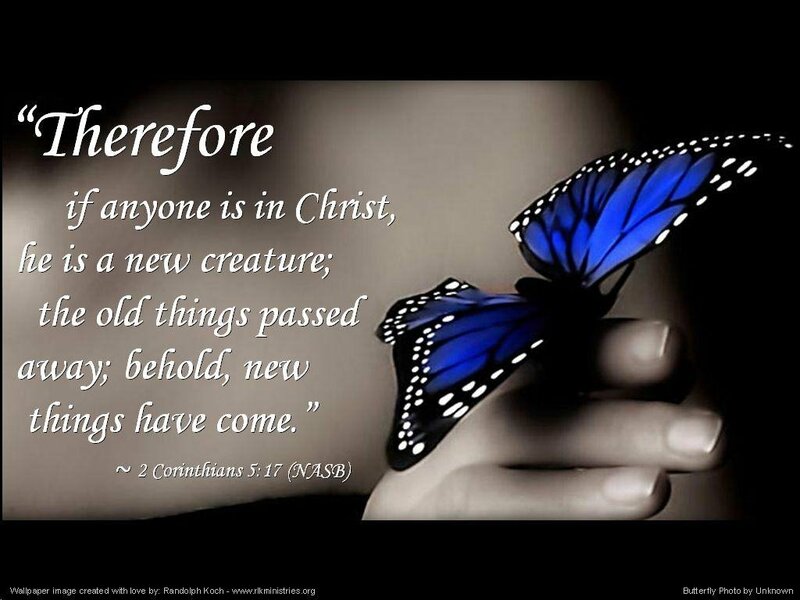 Our old life has passed away and He's given us a new life, a new future in Him! It's a beautiful thing to be in Christ! I was also reminded that life doesn't always seem beautiful or new does it? Sometimes life and our walk with Christ seems to be a little less shiny and new because we've placed other things in the way like our feelings, emotions, or other things and because life is just too busy at times. What I long fore more of and what I pray we all long for, is more of Christ. More of the newness that we once had but the years have taken from us, or rather, we've allowed them to take from us. We need to pray each day for God's glory that the shiny newness of life in Him will be there not just emotions but the burning passion for the life He has for us and a deeper desire to know and live out His will. I don't know about you but I want to wake up more often with the same excitement and zeal I had when I first began to walk with Him. The Word of God - Spend adequate time reading, studying, memorizing it so you'll hear from Him and find further direction for your life. Prayer - Approach the throne of Grace more often - get into your prayer closet and communicate with the One who knows and loves you the most so you can hear from Him. Worship - worship Him with your life and worship Him through song as He's worthy of our praise and your life should be evidence of this! Church- God has called us to not forsake meeting together to be instructed in His Word and operate as part of the body of Christ. We need the fellowship of other believer's centered around Jesus Christ and The Word of God. We aren't created to go it alone. If you're not currently a part of a Bible centered / Christ Centered Church, get out of bed or off your easy chair this Sunday and begin seeking the local church body He wants to be a part of. Ministry- Find out how God wants you to serve Him, how He wants to use you according to the gifts and talent He's given you. Again, God and the Body of Christ need you so be engaged in God's plan which you're a part of. Don't cheat yourself, God, or the Body of Christ by not using your gifts and talents to minister to and serve Christ. 1. When was the last time you thanked God for your new life in Christ? 2. Have you prayed that God would help you live in that newness, for His glory? 3. How regularly are you spending time with God in studying His Word and through prayer? 4. Do you desire to live out your new life in Christ? 5. What is the new life? What does the scripture say about this? 6. Are you regularly seeking to worship God with your life as well as through song? 7. Are you seeking to memorize portions of scripture? 9. What can you do now to further live out your new life in Christ and maybe recapture the passion for God and the things of the Lord you once had? May God bless you much. Please see the attached wallpaper image I created last week and wanted to share with you. I hope it will be an encouraging reminder that God has made you new and given you a new life to live for Him! Finally, Please pray for me as I prayerfully seek God and assess what He wants me to focus on and what He wants me to cut back on all together. Thanks!